What a wonderful organization the Grange is. You can visit any Grange anywhere in the country and feel at home. Your fellow brothers and sisters will greet you and probably want to compare notes on how things are done in Connecticut. Isn’t this something you want to share with your family and friends? One good way to introduce them to the Grange would be to bring them to “Let’s Celebrate”. I have been asked what we are celebrating. 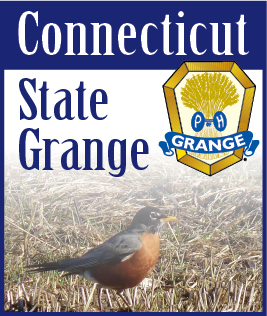 We are celebrating The Grange and what a wonderful organization it is. On Saturday, June 7, at Cheshire Grange Hall we will be judging both the CWA contests and the Photo Contest which is in the Lecturers Department. that day. You can mail them to me ahead of time, bring them to our State Grange Office by Wed. June 4th or give them to me whenever you see me. Sunday, June 8th we will celebrate. Cheshire Grange Hall will be open at 10:00 a.m. so you can check out the winners in all the contests. At 11:00 a.m. Barbara Kulisch, our State Chaplain, will conduct our Grange Church Service. Following the service the Youth will be serving a Lasagna Dinner. Then at 1:00 p.m. we will gather in the upper hall for our “A Number” and Talent Contests. Has your Pomona had its’ Talent and “A Number” run-offs yet? Every Grange has some talent. Why not enter the contest and show everyone that your Grange and your Pomona are actively supporting our efforts? The “A Number” theme this year is “Gardening in Connecticut”. All Pomonas are expected to have an entry in this contest. If necessary the Pomona Lecturer can get people together from various Granges in their Pomona and put on the number. There are endless possibilities using this theme. Hope to see you in Cheshire June 8th and around the State before then.